This post is sponsored by TruMoo for Markerly. So I’m a little behind on national pie day but hey no one said we couldn’t have national pie week or month. Matter of fact, I’ll take pie all year round. 🙂 This yummy recipe incorporates TruMoo’s new February limited edition chocolate milk, Chocolate Marshmallow. Yum! It can be found in your local Target as well as other chain stores nationwide. 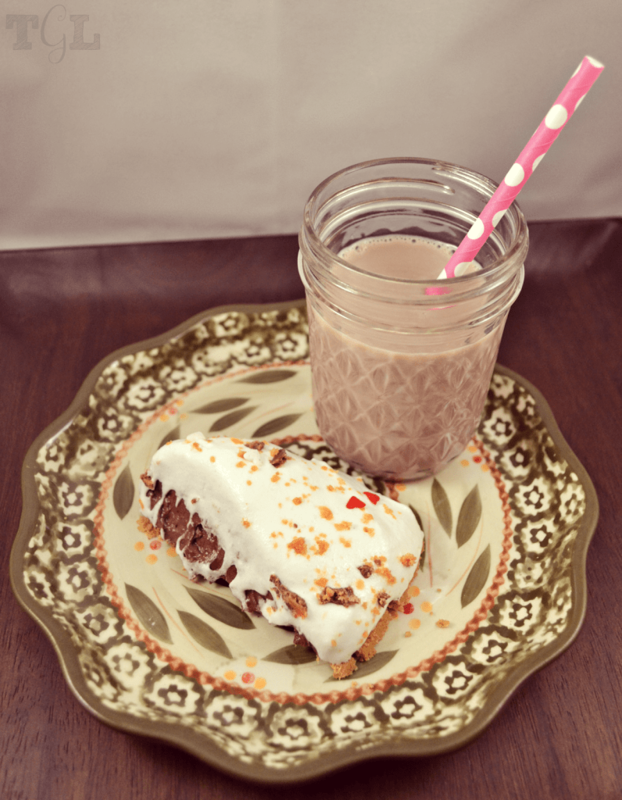 If you can’t find the marshmallow flavored milk TruMoo’s regular chocolate milk will work for this recipe too. Beat TruMoo chocolate marshmallow milk and pudding mix together for 2 minutes. Stir in 1/2 tub of whipped topping and 3/4 of candy bar. Sprinkle the rest of the candy on top. You can enjoy right away or if you want it to set up a little refrigerate for 1 hour. We added a little extra Valentine’s flair to ours but you can skip that part. You can also add chocolate shavings or substitute the butterfinger bar for your favorite candy. 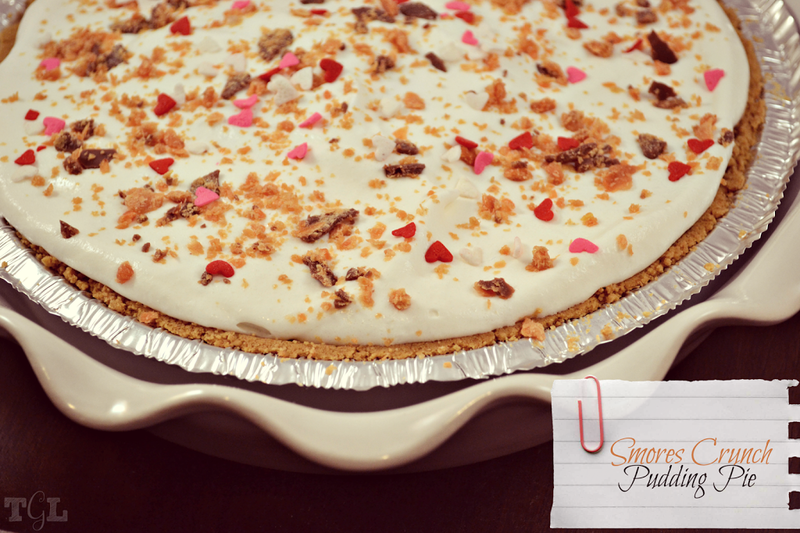 This pudding pie is so yummy and goes great with a nice cold glass of TruMoo chocolate milk. You can feel good about spoiling yourself and your little ones because TruMoo Chocolate Marshmallow milk is made with fresh white milk sourced from regional dairies around the country. They add pure cocoa and just enough natural sugar to make it taste great. TruMoo Milk contains no artificial growth hormones and no high fructose corn syrup. How do you like to drink your chocolate milk hot or cold? No kidding, my husband has a glass of chocolate milk before bed every night. I’ve been known to tell him he was going to turn into chocolate milk. haha! We all like to drink ours cold but I do enjoy it hot with my hot chocolate mix. I know some of us could use a thawing out so one of those sounds great right about now. OMG I’ve never even heard of Marshmallow flavored milk!! But it sounds delicious!! They are so easy to make it’s not even funny. It’s no bake! I SO SO SO SO need to find and try this! If you can’t find the marshmallow milk then their regular chocolate milk works great too. Oh my word! CanNOT wait to make this! Adding it to our menu as soon as we get back from vacay! Pinned! Thank you! I love that you can try it hot AND cold! Thanks for sharing! Pretty sure my kids would die for some of this deliciousness, ha ha ha! Marshmallow flavored milk? GET OUT! Omg, we have to find this! My kids will be in love! I think I need this right now!! Since we’re having a snow day, I need some hot True Moo now.